I was pretty young when I read Leonard Nimoy's prior memoir, I Am Not Spock, and I was kind of bothered by the title at the time. As a fan I felt a little hurt to see that his book seemed to imply that he didn't want to be associated with his character. But of course this was not how he actually felt and the book went into detail about his complex relationship with his character. It was actually a great read and it provided good insight into Leonard Nimoy as an actor. I Am Spock is the sort of follow-up to that first book and a more direct reminder to fans that he loves his time as Spock and a sign that he has a wry sense of humor. So it was just a little shady but in an elegant, clever manner. In line with my recent love for audio book versions of biographies, I picked up this title as another way to celebrate the man that is Leonard Nimoy. And like my feelings over hearing Carrie Fisher read her own memoirs, it was pretty emotional to hear him talk about his life. 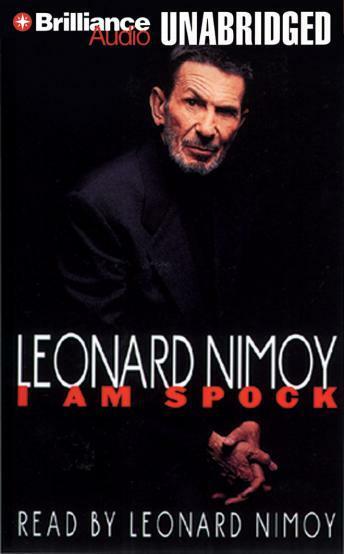 Synopsis: I Am Spock is Leonard Nimoy's second memoir and a more or less direct follow-up to I Am Not Spock. This review covers the Brilliance Audio edition of the title sourced through Audible. The book starts right at the heart of things - the story behind the title of his last book and the backlash he experienced after its release. And he goes on to explain that in many ways it's hard to tell where he ends and where Spock begins - so much so that parts of the book are from the perspective (or at least the words) of Spock and not necessarily his own. The book goes into detail about his acting life and how he ended up with the role of Mr. Spock on Star Trek. But it also goes into his life after and how he decided to take on the role of director for Star Trek III and other projects after that. And on the whole it's a lovely little journey through his life. What I Liked: There's something about Leonard Nimoy's voice that makes him sound to pragmatic about things. Even when he's talking about some of the greatest moments of his life, he still sounds a little Vulcan or at least not as emotional as you'd expect a person to be under similar circumstances. But that's part of his charm and it helps convey how honest he was in terms of what he decided to put into this book. And it's pretty intimdating how seriously he took his work. This book stresses how thoughtful he was when it comes to his craft and how he tries to do justice by all of his characters no matter what the circumstances. And thus the level of art he tried to imbue into a Shakespearean play was no different from portraying Mr. Spock missing his brain. More than anything this felt like a rather personal journey and exploration of his life - moreso than any other biography like William Shatner's book or even the documentary by his Leonard's son. What Could Have Been Better: There is some degree of overlap between what was covered in I Am Not Spock and I Am Spock. I suppose that's unavoidable as both books explore overlapping periods of Leonard Nimoy's life, especially when it comes to his professional career as an actor. His perspective has changed a bit over the years between the books but not by all that much. And so it's a little hard to distinguish the two. As is prudent in these cases, it feels like he's a little careful about what he chooses to say when other people come into the story. You can feel him tiptoe a bit around the complexities of his relationship with Gene Roddenberry but he does acknowledge they often did not see eye to eye. He also makes reference about William Shatner's tendency to grand stand but also backs away as Bill was still a dear friend to him at the time he wrote the book. It's neither here nor there but you can't help but feel that there's more to things that was left unsaid. TL;DR: I Am Spock is still an interesting look at his life and hearing these stories in his voice and even Spock's voice adds a completely other dimension to things. It may not necessarily anything new to the diehard fan, but sometimes you just want to hear his voice again. Thus the book gets a good 4 conversations between Leonard Nimoy and Spock out of a possible 5.